Today, SAS has decided to order 50 Airbus A320neo aircraft with delivery from spring 2019 through 2023. This order means SAS for the first time will have a single-type fleet by 2023 that consists of the market’s most efficient short- and medium-haul aircraft in terms of cost and environment. “Just over one year ago, we started to phase into service brand new Airbus A320neos, and since then we have received a very positive response from our customers. I’m therefore delighted that, through this order, we can continue improving and investing in our customer offering, and thereby SAS’s future. We are also creating a single-type and more efficient fleet for the first time. Ordering 50 Airbus A320neos gives us access to the market’s most efficient aircraft thereby enabling us to further improve our operational efficiency and to continue to reduce our climate-impacting emissions,” says Rickard Gustafson, President and CEO of SAS. “We are proud with this repeat commitment by SAS. The A320neo will complement SAS’s existing Airbus fleet, with unbeatable fuel efficiency and the lowest operating costs and environmental footprint. It is the perfect choice for SAS, for replacing its older generation aircraft. This means more of SAS’s passengers will keep enjoying the best comfort in the skies,” said Eric Schulz, Chief Commercial Officer, Airbus Commercial Aircraft. The investments in the customer offering and efficiency enhancements over the past few years have contributed to SAS’s improved profitability, which in turn has enabled this aircraft order. SAS is in the process of implementing SEK 3 billion in efficiency gains by 2020. SAS will have to continue to improve efficiency even after 2020. The renewal of the aircraft fleet together with the implementation of the single type fleet means SAS can take efficiency enhancements of its operations to the next level. SAS has already 17 Airbus A320neos in service from a previous order for 30 Airbus A320neos. Today’s order means that SAS will have at least 80 Airbus A320neos in service during 2023. The order for 50 Airbus A320neos is split into two parts. The first 15 new Airbus A320neos, with deliveries from the spring of 2019 through 2021, have been secured through declarations of intent with lessors. The remaining 35 Airbus A320neos are planned to be delivered directly by Airbus up to 2023. The aircraft order also includes options for an additional five A320neos. Moreover, SAS has the possibility to increase the number of aircraft that can be leased from lessors. Alongside existing aircraft, this also creates flexibility for growth under the right circumstances. The aircraft will be financed through a combination of finance leases, sale and leaseback, and cash flow generated by our own operations. All of the aircraft will be equipped with SAS’s high-speed WiFi and have SAS’s appreciated new cabin interiors. During the 2010s, SAS worked on harmonizing and simplifying its aircraft fleet. Today, SAS has two aircraft types in service within Europe, compared with six different types in 2012. 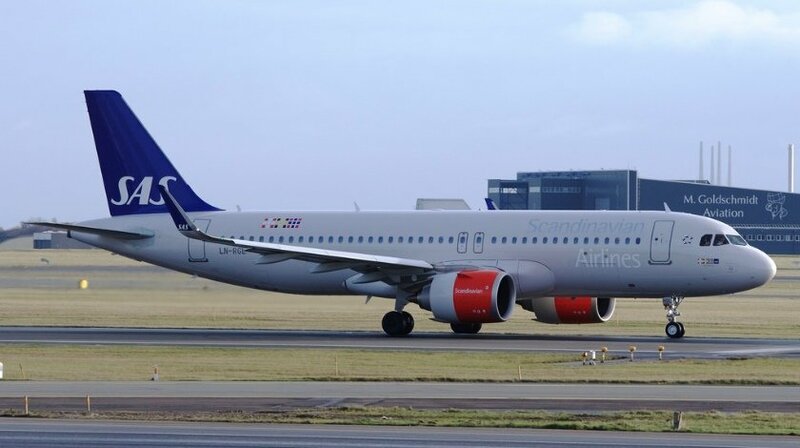 In line with the deliveries of the new Airbus A320neos, SAS will begin phasing out its Boeing 737 and the existing Airbus A320 aircraft. At the same time, SAS will further simplify its aircraft fleet into a single-type fleet consisting of Airbus aircraft on both short-, medium- and long-haul routes. This will lead to increased flexibility, and enable further standardizations and enhancements to efficiency in the production. As a whole, this aircraft order will provide SAS with an extremely competitive aircraft fleet in terms of environmental impact, customer comfort and cost efficiency. The list price of the 35 A320neo aircraft, including engines, directly purchased from Airbus amounts to just below USD 4 billion, before discounts agreed between SAS and Airbus. The other 15 A320neo aircraft will be leased from lessor companies. The order to Airbus is made by SAS and its wholly owned subsidiary Gorm Asset Management Ltd.
SAS has not yet selected the engines that will be used on these aircraft.